Four galleries discuss making it in the art biz. Choosing a gallery space is like choosing a lover. That’s how business owner Elizabeth Eisenhauer described opening up her space in 2000. Eisenhauer Gallery is located in the heart of Edgartown, and is one of the most well-established galleries on Martha’s Vineyard. According to Ms. Eisenhauer, this is her business’s best year. Running a gallery isn’t a kick-back-and-relax sort of gig. The Island is packed with people wanting to buy art, and with 30-plus galleries to choose from, each business has to offer something different. What does it take? The Times caught up with four galleries that are longtime staples in the art community — Eisenhauer Gallery in Edgartown, Louisa Gould Gallery in Vineyard Haven, A Gallery in Oak Bluffs, and Field Gallery in West Tisbury. Ms. Gould has had her Main Street, Vineyard Haven Gallery for 14 years; she represents a large range of work to please a large range of clientele. She started out by envisioning herself as old, retired, and running a gallery on Martha’s Vineyard. But businesses like that take time to build. 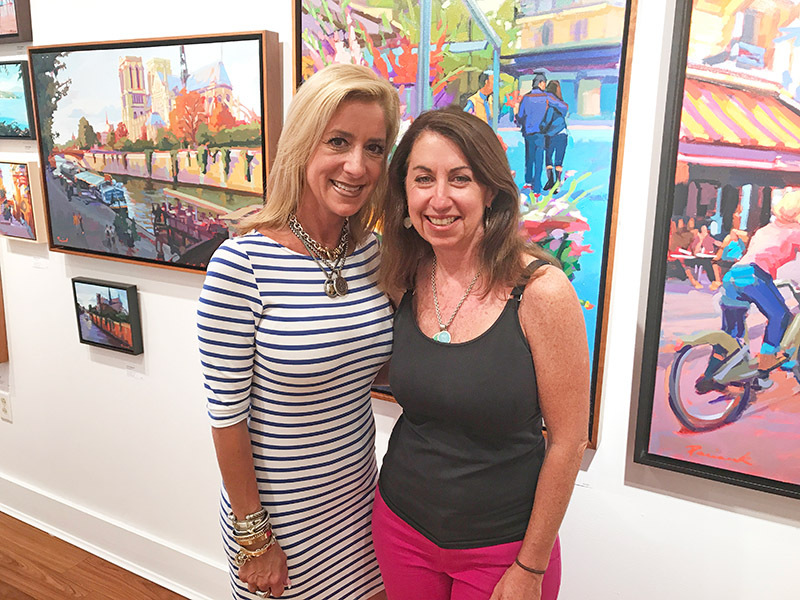 Ms. Eisenhauer at Eisenhauer Gallery didn’t know how opening a business on North Water Street in Edgartown would go, but she had a good feeling. She and her husband, Paul Caval, opened a gallery on Block Island in 1997, and didn’t plan to own another on the Vineyard. “We originally just moved here to put our son in a better school,” Ms. Eisenhauer said. “I didn’t even consider opening up a gallery. But when I noticed an ad for a commercial space on [North] Water Street, I sort of got goosebumps. My Block Island gallery was on Water Street. That planted the seed.” Ms. Eisenhauer and her husband have been in that space since 2000. For some galleries, being on the Vineyard informs the choice of art displayed. For others, it doesn’t at all. Eisenhauer Gallery and Louisa Gould Gallery both fall under the latter, as does Tanya Augoustinos’ A Gallery on Upper Circuit Ave.
Jennifer Pillsworth has run Field Gallery in West Tisbury for 14 years, although the gallery itself has been there since 1970. Field Gallery owners Chris and Sheila Morse also founded Granary Gallery in West Tisbury, and North Water Gallery in Edgartown. Field Gallery is the only art gallery on Island that was specifically built to be a gallery, and nothing else. According to Ms. Pillsworth, the focus of the Field Gallery is contemporary work, and unlike Louisa Gould, Eisenhauer and A galleries, the work displayed has to have an Island connection. Field Gallery represents artist who create in many mediums, and the gallery (and lawn) is home to oversize canvases, large whimsical sculptures, and bronze pieces. Marketing a gallery on a small Island is critical for business. All four galleries agreed that word of mouth is more measurable than anything else, but that they advertise in newspapers and magazines, send out newsletters, update their websites, and organize community engagement events. “We hired someone to do marketing and promotion,” Ms. Pillsworth of Field Gallery said. “We used to try to do it ourselves, but as a business becomes more successful, you have less time for that.” Field Gallery also uses social media. According to Ms. Pillsworth, they usually host one fundraiser per year. “Chris and Sheila are incredibly connected to the community,” she said. According to Ms. Gould at Louisa Gould Gallery, she was one of the first people on-Island to use email campaigns and a website for her art and photography. These were the days when businesses had to hire someone to build a website, and she still uses the one created for her gallery back in 2005. She recently hosted her fourth major opening for the summer, and also organizes frequent book signings and trunk shows. Each gallery has its own personality and sense of energy. A successful gallery, according to Ms. Augoustinos, is one with the atmosphere to accommodate the art. If a piece calls for the room to allow a person to step back and take a look, give it that space. And while each gallery is different, they have this in common: Each is dedicated to celebrating emerging and established artists as well as the people who appreciate them.